Demographers know 1970 as the peak year of Australian births, the year the baby-boomers created their own demographic bump, before declining fertility set in. It is largely coincidental that that year, and those either side of it birthed the single greatest collection of Australian cricketers in an already illustrious history. Pushed through the newly formed academy, great cricketers emerged like golden eggs, faster than the test side could absorb them. A handful of them formed the best test team of their era; most found solace at first-class level, where even uncapped players were historically prolific. Ricky Ponting was younger. Born in 1974, he forced his way into their midst by weight of runs and obvious talent. Like Messi, an under-sized wunderkind who transcended even the great players he was surrounded by. From youth and talent he also outlasted them all, the final light of an era that Australian cricket will probably never repeat again. 1995-96 was an interesting moment in recent Australian cricket. Australian teams that thrash England are generally granted stability - and vice versa - but by 1995 the Ashes team of 1993 - Taylor, Slater, Boon, Waugh.M, Border, Waugh.S, Healy, Warne, May, McDermott, Hughes - was beginning to fall apart. Border had retired; Langer and Martyn had had a baptism of fire the summer before, missing the Ashes boat, Bevan and Blewett had been tried, but not succeeded. May and Hughes had gone, but McGrath and Warne had arrived; the Waugh twins, freed from the responsibility of bowling, had their most productive seasons, but the rest of the side was less solid. Of the eleven that lined up in Perth with Ponting, four wouldn't play again beyond that summer - Boon, Law, Julian, and McDermott - and Slater would be dropped for recklessness in India less than a year later. Ponting couldn't have asked for a harder assignment in his first year. Shunted up to three, but without the stability of Slater or Boon, and with Taylor entering a prolonged slump; pressured by the weight of runs coming from Bevan, Hayden, Langer and others, he was quickly dropped. It is a measure of him as a player that he immediately got back to scoring runs: three tons in Shield cricket that same season, a place in the squad to England, and, having bided his time again, a first test century at Headingley. The next four years weren't memorable ones for Ponting, or even Australian cricket. Sheltered at no. 6, Ponting meshed with the Waugh clean-up machine, but although there were runs, there were few defining innings - 197 vs. Pakistan in Perth, 105 vs. South Africa in Melbourne being the best. Just plenty to clean up. At the top of the order, chaos reigned. No less than seven players were used in the top three after Boon departed; the 1st and 2nd partnerships averaging just 36 over five years. Australia remained number one, but not convincingly; even after 16 straight wins. There was a sense that the golden generation, whose flashy talents had so impressed playing as Australia A in 94/95, lacked the grit to get the job done. England talked up their chances of winning the Ashes in 2001. They wouldn't, but they did succeed in settling Australia's top-order woes. Australia seemed to stumble onto, rather than choose a top-3 of Hayden, Langer and Ponting; but it worked. For the next six years the 1st and 2nd partnerships averaged 61. Ponting averaged 73 in this period, 62 away from home, a scarcely credible 94 in the 4th innings. On Australia's hard true pitches he drove with impunity, and pulled with a dismissive authority no contemporary could hope to match. Behind them, Martyn, Lehmann and Gilchrist pillaged, rather than cleaned; while Warne and McGrath became such a dominant force that Australia lost just the single match (of 44) where both were playing. The problem with having a lot of great players the same age, is that they retire at the same time. The problem being younger, is you get to carry the load. The last five years of Ponting's career were a constant struggle, and yet within that struggle his fighting qualities came to the fore. Sometimes in bad ways. He was a poor captain, easily frustrated by umpiring and his bowlers, and lacking trust in a long train of spinners. His own form waned. The tendency to prod forward became more pronounced and he offered the slips and close catchers plenty of chances; particularly away from Australia, when the ball swung or spun; he started getting roughed up by quicks; the tendency to fall over on the drive left his pads and stumps exposed. Facing difficulties he worked harder, off the field and on. He played some of his most important innings, even as his troubles became increasingly obvious. 156 on the last day in Manchester to stave off defeat in 2005; 118* in Fatullah to scrape past Bangladesh; 123 in Bangalore to make a statement of intent; 101 and 99 in Melbourne against South Africa, as his team collapsed around him; 62 in Johannesburg to help tie a series. What motivates someone to play cricket, also seems to be what motivates them to stay. Of the three great attacking batsmen of his era, Lara seemed most invested in the contest between bat and ball. He played for fun, to entertain, and to dominate, and he quit when the trials of West Indies cricket overwhelmed him. Tendulkar seems to be the ultimate cricketing existentialist; playing on because to do otherwise is to deny himself. Ponting has always played to win. His legacy became increasingly tarnished by failure, causing great angst for selectors who hadn't had to end a distinguished career for half a decade. Ponting, to his credit, if not necessarily to the team's benefit, refused to give up, playing on because he believed he could contribute, throwing off tradition to relinquish the captaincy and play under Clarke, working ever harder. When announcing his retirement, he stated frankly that he no longer felt he was contributing sufficiently, and will leave the crease knowing he gave everything to the cause. Ponting was the last player of a generation that arrived on the scene just as I grew into test cricket. A generation that grew up when Australia lost as often as they won, and relished every victory. They weren't always likeable - perhaps even none of them were - and I'll always retain much greater affection for the 90s, when they were young players finding their feet, over the early-2000s when they swept all before them. But there was no denying they could play, or that Ponting was the best of a great batting lineup. And while he could have left us much earlier, with an average much higher, any history of that era will need to reserve a special post-script for Ponting, whose quixotic attempt to deny time and the passing of that era will end in Perth. Another draw, but let noone suggest it wasn't a great game, in what is becoming a war of attrition. Australia will go to Perth without any of the quicks they started this game with, while South Africa ought to get Philander back, but will be without Duminy, Kallis having recovered (at least partially). Australia's depth will be tested to the limit, and there are good reasons - statistical reasons - to suggest that picking Hastings and Johnson over other contenders - Cutting, every bowler in Tasmania - is a mistake. The official ICC number one ranking is on the line is Perth, although even with home advantage, and a slight advantage in the series to date, the fast bouncy pitch and the age-old rule that the team that fails to take their chances will eventually fall behind would favour the South Africans. Adelaide was a fascinating game, beginning with Australia's assault on South Africa, and ending with both Siddle and Du Plessis out on their feet, as South Africa scraped the draw. Much has been said about Tahir, but the most extraordinary aspect of Clarke (and Warner's) innings was their dismantling of Morkel. The tall quick bowled very well, but seemed lost for an option at times as both batsmen destroyed him - Warner smashing 48 off 44, Clarke 70 off 56. The fast scoring ought to have earnt Australia the win as they had plenty of time to bowl out South Africa, but Du Plessis (110 off 376), de Villiers (33 off 220) and Kallis (46 off 110) denied them for four sessions. That longevity came back to hurt Australia, as Siddle couldn't recover from the 64 overs he let go, and we don't know the state of Lyon who managed to bowl 94 - more than an entire day. Lyon may or may not be useful in Perth anyway, but don't ever doubt his skills. Anyone who can play well in Australia (and 5/140 in 94 overs is well), will do very well when they travel. South Africa need support for Steyn and Morkel. If Philander has recovered he might be the difference, as he'll get more help in Perth. Or Steyn will go berserk and destroy Australia. Australia have stuck their hand in the lucky-dip makred Mitchell Johnson. The weather is cool, sometimes overcast, so the pitch won't crack, and may end up being a Brisbane-esque road. We haven't had a result yet in this series, and we might not at all, but as arm-wrestles go, it has definitely been interesting. West Indies didn't make the mistake of batting first this time, and although Bangladesh made plenty of runs, you'll always struggle to not lose if you concede 648. The story from day one was Abul Hasan making a debut 113 from number 10. he went on to take no wickets, which will make for an interesting selection meeting. It is a sign of Bangladesh's willingness to fight at home, and they dragged this game into the last day before Tino Best again wrecked them with 6/40. Bravo (127), Samuels (260) and Chanderpaul (150*) did the damage with the bat, with only Shakib al Hasan making in-roads (4/151). He has now taken 100 wickets and is just short of 2000 runs. He'll be both the youngest and fastest (in matches) to do that double when he does it shortly. A loss though, is a loss, and while Bangladesh are improved, like Sri Lanka and New Zealand before them, they aren't going to win many until they get a bowler who can take wickets in bundles, instead of dribs and drabs. In my review of the first test I implied England would need more contributors than just Cook, Swann and half of Prior. It turns out two more was sufficient. Panesar relished the bounce and turn at the Wankhede, taking 11/210, and supported by Swann's 8/113. Cook found his support in Pietersen, whose 186 off 233 balls was typically brutal, while raising the question of how a batsman can alternate from completely clueless against left-arm spin to dominant with such regularity. Apart from Compton, the rest of the English side hardly turned up. That is a problem if India ever remove Cook early, but they have their lengthy set of issues. Ojha was again very good (5/143) and Ashwin again poor, although he scored 68. Aprt from Gambhir's fighting rear-guard in the second innings and Pujara's 135, India's batting didn't produce. Whle a case can be made that on a spinning pitch a score of 327 is close to par, 468 runs for the match will lose many more games that it will win. Their tail is long and irresponsible, and their middle-order (starting with Tendulkar) isn't make the big scores they need. The ratings have India slipping backwards again, closer to the West Indies than a decent side, and the path back to the top looks long in their present state. For England, they needed that win to maintain their position, but four players can't be expected to win a series. The rest of the batting needs to support Cook, and the pace bowlers need to find their line and length. It will be interesting to see if India continue to produce spinning pitches given they succeeded on a low slow batting track, and failed badly on a bouncing turning one. Dhoni seemed to get what he asked for in the last test. It is up to the team to make use of home conditions. Quite the surprise result. Because Sri Lanka have slipped down the rankings it doesn't seem so surprising that they might lose to New Zealand, but given New Zealand's recent record, and Sri Lanka's home record drawing the series is a huge victory for the Kiwis. Sri Lanka's recent weakness was the decline in their bowling post-Murali; their current one seems to be the recurring theme of the week, a slipping from the experienced trio Dilshan, Jayawardene and Sangakarra. Mathews and Samaraweera made scores, but two sub-250 scores puts a lot of pressure on Herath. Herath did his best, taking 9/170 in the match, He was matched though by Taylor (142 and 74) who might finally be producing scores in line with his talent, and Wiliamson (135), who put on 262. With the ball, Southee and Boult bowled with pace and purpose, getting good bounce and backed up with catches in the slips: Guptill and Williamson took 9 in the match, a couple, one off Herath in particular, absolute screamers. A fortnight from now, these two sides will play swaps with the leaders. New Zealand heading to South Africa, which will give a better guage of whether their low ranking is justified. Their last tour there was a disaster, collapsing repeatedly and suffering long days in the field. They seem a better side now, but it is a big test when they haven't won there since 1994. Sri Lanka, arguably, have an even bigger one, travelling to Australia, the graveyard of spinners, where they have never won. Kulasakera is the kind of bowler who might do well in Australia, but he'll need support, and it isn't clear who can provide it. But, like India, Sri Lanka are in the middle of a transition, albeit with fewer obvious replacements for the greats departed or about to go. After distributing some truffles to work a couple of months ago, a colleague suggested they'd like some lamingtons for their birthday. I don't bake cakes though - I can, I just don't - but the concept intrigued me, so after some hunting around in Greweling's masterpiece Chocolates and Confections I endeavoured to bundle together a few recipes and create the closest thing: Lamington Chocolates. 1. Hydrate the gelatin with the water, and melt in a water bath. 2. Combine the strawberries, glucose syrup and sugar in a saucepan and cook to 135degC. 3. Pour mixture into another bowl, allowing mixture to cool to 120degC then add gelatin and lemon juice. This is the jam part, obviously. It is a bit of a mismatch, and might do with some kirsch or similar. The general rules seems to be to have 1/3 water and 2/3 sugars and to cook to 106 to 135 degrees. Any jam recipe with the gelatin added will work as well. I decided on a jelly instead of plain jam for two reasons. Firstly, the last time I made jellied chocolates I got significant moisture bloom. Although I suspect that was a tempering issue, I didn't want to risk it with a runny jam. Secondly, although I'd have liked to encase the jelly as in a lamington, I wasn't sure if that would be feasible - I am still not - so I included enough gelatin to not only set the jelly, but ensure it could support the weight of the nougat. 1. Melt chocolate and sift together milk powder and sugar. 2. Combine egg white and 20g glucose syrup in mixer with whip attachment. Do not begin mixing. 3. Combine sugar, water and 270g glucose syrup in a saucepan. Cook to 110degC. 4. Start mixer whipping on high. Continue cooking to 118degC. 5. Stream the hot syrup into the whipping whites. Continue whipping for approximately 8 minutes until mixture is cooled to 50degC or machine slows. 6. Add the vanilla. Remove the mixture from the machine and mix in melted chocolate, followed by sifted dry ingredients by hand. Who knew nougat was so simple? This literally took 20 minutes. Nougat was the closest I could come up with for a cake-like centre. Soft chocolate nougat is normally brown (like in a Mars bar) but the white chocolate and milk powder kept it a white colour. A few of my pieces had slight leakage, which means it either needed less whipping, or more dry ingredients. It could probably have used more white chocolate too, as the flavour is delicate, and it came out very marshmallow like, rather than the slightly denser chocolate nougat I expected. There was nothing wrong with the flavour. 2. Empty nougat into tin, press into corners and flatten. 3. Pour partially set strawberry jelly onto nougat and refridgerate. 4. Melt and temper a large amount of dark chocolate. 5. Coat the jelly side of the slab with chocolate. Let set. 7. 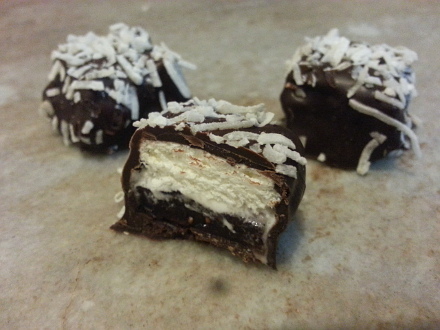 Dip each square in chocolate, and immediately sprinkle a pinch of coconut on top. This was the easy if tedious, part. Keeping the chocolate tempered is the difficult bit, but with practice I am starting to recognise when it needs a little heat, or re-tempering. I would have liked to put the jelly in the centre, as in an actual lamington. I think it is possible, but the nougat will need to be divided and rolled into shape, then layered on gently. I don't know if it is worth it. The book always indicates hundreds of pieces from this weight of ingredients, but I only got 88, and found it difficult to cut without a guitar. Alternative methods being considered. Still 88 pieces of chocolate is a lot, even when you give a lot away. My jelly didn't turn out perfectly because the strawberries weren't cut sufficiently, and therefore weren't distributed very well. I have adjusted the recipe to include more fruit as the pieces with a large amount of fruit perfectly offset the nougat. The jelly only bits tasted a little fake, over-powered the nougat taste and the layers separated (sometimes during dipping). Nevertheless, these came out really well. It is worth starting with the pitch. For many years Brisbane basked in the reflected glory of Australia's great players, offering bounce and pace to McGrath and others, bounce and some turn to Warne, and a flat surface for the Australian top-order. It had a reputation for fairness and offering a little to everyone. At the other end of the ledger, were often test cricket's weakest batting lineups, and often most limited bowlers. In the past two decades it gave a lot to Australia, and nothing to New Zealand, West Indies, Pakistan and Sri Lanka (sans Sangakarra), who sustained twelve losses in thirteen games. Australia averaged over 50 per wicket in the past two decades, but layed South Africa and India only twice, both draws, along with two more against England. Against decent lineups, without two of the game's greatest bowlers, Brisbane's result pitch has been a road. To be fair, this game might have produced a result, without the rain, that further delayed the drying process, and negated Australia's final push for victory. But then Australia were playing against ten men, at least one of whom was superflously included as a fourth seamer, any tactical merits of which were negated by batting first. With Adelaide and Perth to come - both notoriously flat unless the heat bakes and crumbles the surface, which won't happen in late November - we might be looking at a rather tedious series. Unless one side collapses, that is. Steyn can take wickets anywhere, when the mood strikes, and Australia's top order still hinted at vulnerability, despite Cowan's century, and Clarke's remarkable dominance. Serveral of the bowlers failed ot help themselves, bowling no-balls, and costing themselves vital break-throughs. The umpiring referral of these is an abomination, not least because the so-called "technology" being used is decades old, but only recently implemented. If the ICC was serious about removing incorrect calls it would invest in technology that made the calls automatically, and informed the central umpire. Tennis has had no issue doing so on lets and faults - though even they implemented a half-baked review system. Cricket ought to do the same. A final non-cricketing note on crowds. The first day was unexpectedly good, although given this was the first non-English marquee side to play the Gabba, it ought to have been. English writers harp on them, but several differences are worth noting. Australian crowds can afford to be fickle; the grounds are never full, so patrons can choose which day they attend - or not attend, if they'd planned to go on Saturday. Tickets are not cheap, but they aren't so outrageous they won't choose to go home (or to the beach) before play ends, which leaves large areas of the stands empty for periods. And finally, the catchment for Brisbane (around three million) is a tenth of English grounds, where distances are shorter to travel. 45 thousand across four days is not a great crowd, by any means. The MCG will cater for 160 thousand for a lesser team, albeit during holidays, and a slightly larger population. But with such vast grounds, weekday games, and such an unattractive setting - not the seating, which is awesome, but the food and drink - at prices that mitigate against attending multiple days, it is inevitable that the last couple of days are played to empty grounds. Cricket Australia seems comfortable with highly differential pricing that reserves the best seats for a few patrons, and a largely empty ground. I don't doubt they've done the figures. Crowd sizes have been fairly consistent the past decade. It would be nice if they were bigger, but there is no easy solution. The crowd in Dhaka looked, by contrast, to be healthy, or at least noisy. Bangladesh may be looking on this match as another missed opportunity. 245 is a difficult target, but not ungettable, even on a turning pitch - and in any case, they were undone by the pace and bounce of Tino Best and some poor shots. Conversely, when the opposition declares at 4/527, you don't really deserve to win, evne if they have collapsed from 1/209 to 273 all out on the fourth day. Better then to focus on a few positives. their batsmen worked hard throughout the first innings, although none went on the way Chanderpaul did for the West Indies, they had six scores over 40 and three over 89. Sohag Gazi survived Gayle's comtempt to take 9/219 for the match, taking some pressure off Shakib, who struggled with the ball, and needs relief from carrying all aspects of the side. And they seem to have dropped only the one catch, which compares favourably with the 45.6% Charles Davis recorded them putting down last year. They still need to improve their fielding, because they leak too many runs, which allows the opposition more time to attack them, and the chases harder. But they've had worse results and their rating continues to improve. For the West Indies, who just missed their margin of victory, and for a period looked like losing the match, this was another sign of increasing resilience. Neither Gayle nor Samuels performed, but Powell made twin tons, and got support from Chanderpaul, Ramdin and Bravo. The wickets were shared, which is also a good sign. Sammy will hopefully think better of declaring before he's had a slog, and as usual they suffered a lot from a couple of poor hours. They can afford to do that against Bangladesh, but they'll be made to pay against better sides, and almost were here. A win for the West Indies, but not a good one. Five players dominated this game. For India it was Sehwag, who brutalised the English bowling on the first morning; Pujara whose double ton was a master-class in working the ball; and Ojha, whose consistency of line and length and willingness to flight the ball got just reward. England's mistakes were many in combating those three. Except Anderson and Swann, who took five wickets, they bowled too short and too straight, allowing the easy runs that you cannot afford in India. Against the spinners they poked forward and waited, even to flighted balls, allowing Ojha and Ashwin to control the parameters of flight and turn that would bring them undone. The exceptions were Cook and Prior, who scored significantly more than half of England's runs, eschewed the straight drive, and either waited on the back foot, or stepped well out to the flighted ball to nullify the spin. Cook's twin innings were both majestic and futile in the same manner as his coach's efforts here a decade ago. England's dilemna is that their best outside bowling options are to replace one or both of Broad or Bresnan for Finn or Panesar. With the batting already a little flaky, losing another 20 runs with the bat (and more again in the field) might seem injudicious. But if either can keep the runs down, they'll make that back even if they don't take wickets. Whether Finn - who can be erratic, but ought to be more dangerous from his extra pace and natural bounce - or Panesar - whose accuracy tends towards a repeatability that hasn't taken many wickets against good batting - can make up for that batting shortfall with the ball is doubtful. India's pacemen, particularly Yadav, were very good, taking wickets at vital junctures and getting the old ball to reverse swing. The best performing sides in India in recent years - South Africa and Australia - have done so led by pace attacks, but demonstrated patience. Unless Dhoni gets the dust-bowl he is apparently hankering afer in Mumbai, the best bet is to focus on the fundamentals that England, only 12 months ago, were very good at. Not that any of that will matter if their middle order continues to put down roots at the crease. England carrying so many players somewhat masked the same problem in the Indian side. They got relatively few runs from their lower order, and let Cook and Prior score heavily. That happens in India, and Dhoni is very patient to the point of being inactive. Nevertheless, they need more from Ashwin, and the clouds continue to hang over Gambhir and Tendulkar. I won't err into saying England can only get better, and the next match tighter, as England can certainly get worse, and India can certainly get better. But there is a lot of cricket left in this series, and lots of room for change. Bless New Zealand, whose incompetent batting allowed space to write this review between tests. This was a low scoring match, played on a typically spin-friendly Sri Lankan wicket, immediately putting New Zealand at a big disadvantage. Herath (11/108) took full advantage, particularly amongst the lower order, and Southee's bets efforts torestore parity were undone by Jayawardene and Mathews 156 run partnership. New Zealand managed an interesting record in their second innings, making the fewest runs of any side where 8 or more batsmen made double figures. Several batsmen might count themselves unlucky in the second innings, but it was their inability to score freely that haunted them. Their top order struggled throughout to score at more than 2 an over, allowing Sri Lanka to dictate play. New Zealand's rating thus continues to slip downwards, likely to drop below 850 for the first time in fifteen years, if not lower. Sri Lanka maintain their reasonable home record, but it seems a long time since they played games anywhere else. Even compared to West Indies versus Bangladesh, this series seems an after-thought, with neither side having much to prove, or to offer. Forget about using the ratings as a prediction. They say Australia should win this but by the barest of margins, adjusted for form, the prediction is as close to 50-50 as it can be. Similarly, forget about recent history, the last series was tied, the two before that were tied home and away. They are two sides joined at the hip, playing with the same brute force and aggression tempered with the artistry of their key batsmen. The series in Australia will, for the first time in recent memory, take to Australia's bounciest pitches, and it does so with the fastest pair of attacks I can recall seeing; and possibly the fastest in test history. This won't be one for the connoisseurs, even with Amla and Clarke's elegance, or the undoubted greatness of Kallis and Ponting. This is one for the fans with blood-lust, who like watching Cowan, Smith and Hussey shovel and leave. If won't necessarily be low-scoring, as Australian pitches are generally flat, but collapses are likely, as I certainly don't trust Australia's batting, and South Africa's lower middle order is suspect. As I write, South Africa have won the toss and decided to bat, despite going in with four and a half quicks. This probably suits Australia twice over, as batting first is deeply over-rated. As always in Australia, the new ball will be central to the outcome, and both sides can exploit it. South Africa should perhaps be slight favourites, given their away record, recent English form, and slightly reduced propensity to collapse. Conversely, Australia are good players of pace, and if the ball stops moving they can score heavily and win. Steyn, as ever, is the key for South Africa, as are Pattinson and Siddle for Australia. A drawn series would be the safe bet, but it seems unlikely to have any drawn tests. Compulsive viewing for certain. A test series marking 12 years since Bangladesh was elevated to the ranks of full members, which if nothing else, provides opportunity to reflect on what a ridiculous system fixed membership and closed shops are. The gap between them and the West Indies had closed for a period. Recent form tells us nothing about Bangladesh, who seem to have retreated, or been beaten back from test cricket; nevertheless, the West Indies have certainly improved in the past few years, and that gap seems to have been restored. Bangldesh's biggest problem is a hopeless dependence on Shakib, who, good as he is, won't win tests with either bat or ball. Although the batting is better than it was, only Tamim Iqbal has had any sustained success, and none recently. On home pitches, favouring spin and batting, they have had moments where a win looked possible, but it seems unlikely that they will do so against Narine and the other West Indies spinners. With Gayle back, and Samuels scoring heavily, only indifference will bring down the tourists. Two flawed sides with much to prove. England come into this tour without their captain and opener of the past few years, a susceptibility against spin bordering on crippling, injured quicks and a marked drop in form from two summers ago. India in transition, having seen some of their ageing and declining batsmen depart, albeit with potentially brilliant replacements, but with continuing question-marks over their openers and Tendulkar, and a bowling attack that hasn't performed well in the past few series. Looking at recent form, and taking into consideration home advantage, the matches should be very close, with India slight favourites. The result will largely hinge on the ability of England's batsmen to combat whichever of Ashwin, Ohja and Harbajhan India put out. Their bowling will suffice, but needs to be prepared for long days. India's recent home record is better than away from home, but they didn't impress against New Zealand or the West Indies, and stuggled against Australia before that. Draws are a distinct possibility if the pitches don't provide much turn. If they do, we'll see an interesting contest, and much comment on home pitches. I'd like to think this series will be competitive, as neither side has played particularly well in the past couple of years. But New Zealand ranged from competitive but losing to woeful on their last two tours, and Sri Lanka remain a force at home, where their batsmen score heavily, and their spinners become world class. New Zealand have no weapons to combat that, particularly with Ryder missing, and neither Taylor or Williamson seemingly able to take the next step. If it rains a lot, and it may, draws are a distinct possibility, but otherwise the home side will have it. Officially the first game of the new season, but counted for today's purposes in the last. Kenya are in an interesting place right now; a young side not without potential, but needing to improve their results if they are to stay in the WCL championship and intercontinental cup after next year's ODI qualifiers. Results like this are certainly worrying. Namibia were held up on the first day by a Mishra century (108), but after a careful start, Williams (140) and Burger (85) put Namibia in a dominant position, and one from which Snymam could attack, making 201 not out from 192 balls. Viljoen and Klazinga once again worked their way through the Kenyan batting, and although Kenya made a reasonable attempt at forcing the draw, they were bowled out after tea on the last day. Namibia maintain ther strong position in the table, and having played both Scotland and Ireland should continue to pick up points in their remaining fixtures. Traditionally the majors look at best performances at the end of the calendar year, but, lying in the middle of variou stest series, it is a poor choice. The two month break for various T20 tournaments provides a much more natural point to examine the past 12 months of results, presented below, with commentary. South Africa were the best team in an even year where all of the top-8 saw some success. Victory over England pushed them to the top of the official ratings and a competent series against Australia from the top here. The downside of their game is a continuing inconsistency, marked by a draw with Australia at home, when they ought to have won 2-0. That team, Australia, never seemed to play very well, struggling against the West Indies and losing to New Zealand for the first time in almost 20 years. But those weaker efforts were matched by a creditable drawn series with South Africa and a flogging of India. Seemingly more settled, but still carrying plenty of older players, Clarke's team remains an enigma. England might feel fortunate to be third, and Pakistan unlucky to be fourth, but while their series was not close on the scoreboard, it was very tightly contested, and England's rating reflects a year of close losses. It is still a huge come down for a side that put up record high game ratings last year. Pakistan were quiet on the field the past few years, but have rebuilt under sound leadership and produced some find performances. Sri Lanka, by contrast, slipped again, and need to find a bowling strategy to back up their still fine batsmen. India somhow managed four wins, but all were against the weakest of opposition, and the marked result of the past 12 months were abject efforts against Australia. Now in a rebuilding phase with the batting, they will either emerge as a dogged team that can play for draws, or a rabble. Either way they need better bowling to compete. New Zealand and the West Indies will both be pleased with their years, although the former slipped again, their victory over Australia and the emergence of some useful bowlers bodes well. The West Indies played some decent test cricket at times, having the better of England in one test and beating New Zealand. Their gradual improvement, dating back to 2008 is quite evident under Sammy. By contrast, both Bangladesh and Zimbabwe seem to be dropping off the test radar, playing no more tests than the associate nations, and at no better level. They could engage in a very interesting competition with those teams, but for obvious reasons - both cash and pride - they don't want to. The top four associates are all quite close, with a fairly small sample size to go on. It is those four who will likely fight out the finals of the I-Cup, although the UAE, who have improved markedly, will try and force an upset. The others have had better years, and all three look vulnerable to upsets in the world cup qualifiers next year.